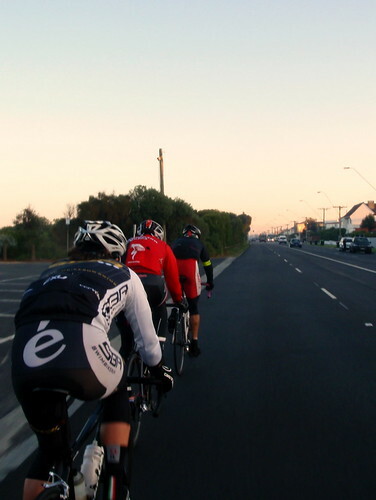 It was eerie rolling through the fog this morning, riders only a few wheels in front were starting to be obscured. Red LEDs flashing through the gloom that deadened all noise but the barest echo of peoples whispers. 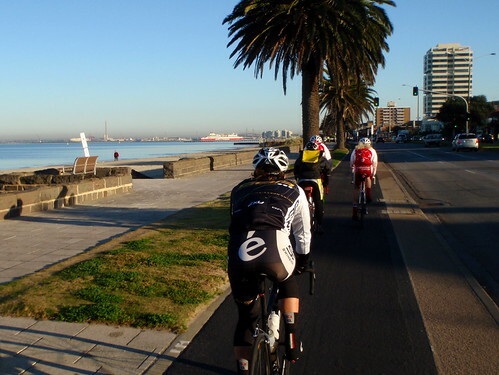 The actual ride though, the bit that starts at Frankston and ends in St Kilda, that was far removed from romanticised prose. I misjudged my effort up Baden Powell Drive and went from stringing things out on the front to back of the pack with a dead legs and a gap to the riders in front. I chased and chased and chased, by the top of Canadian Bay Rd I was in contact with the back markers of the remains of the front bunch. I worked my arse off up Two Bays hoping to see a a handful of riders, I was disappointed to see many more and realise that I'd killed myself for a mid pack result. On the way back to town all the work was done by 4 riders. Two guys (Liwa and um Steve of ex Bike Boutique and mullet fame) doing the bulk, one other pulling hard turns (Leigh Shilling) and me (doing far less than my fair share). Liwa, followed by Leigh, followed by Steve, followed by me. I wasn't quite on the "that is my pain/training" mindset about pulling turns, but this last week or two it's been getting closer to it. I was nice to be back at the front being involved in the pain dealing, rather than hanging on with no control over it.